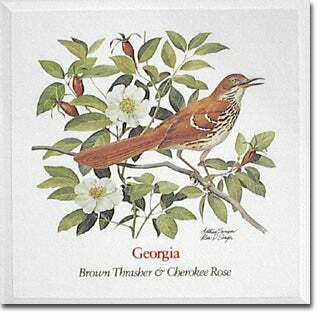 The Brown Thrasher is one of the finest songsters native to America. Farmers hearing him during spring planting say he is giving them advice: drop it drop it, cover it cover it, pull it up pull it up. Though part vegetarian, the Thrasher is a true friend to the farmer since he feeds on destructive grasshoppers, caterpillars, and worms. Some believe he was named for his habit of hopping around and searching for insects under leaves, while others think he may have been named for the way he thrashes large insects to death, or for the way he switches his long tail back and forth. A high-climbing shrub, the wild Cherokee Rose frequently attains the height of a sprawling vine. It is excessively thorny and generously supplied with vivid green leaves. Its blooming time is in the early spring but favorable conditions will produce a second flowering in the fall of the year. Because of its hardy nature, the plant is well adapted to hedge purposes and is often used in this capacity throughout the South. 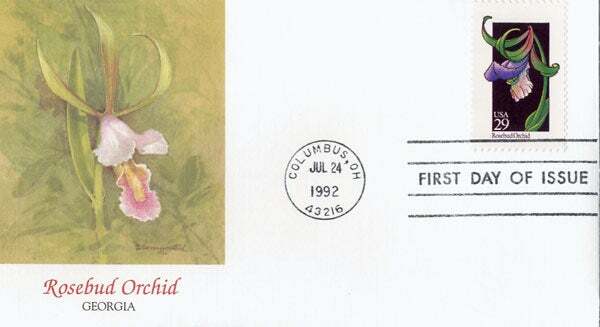 Although thought to be of Chinese origin, the Cherokee Rose derived its American name from the Cherokee Indians.